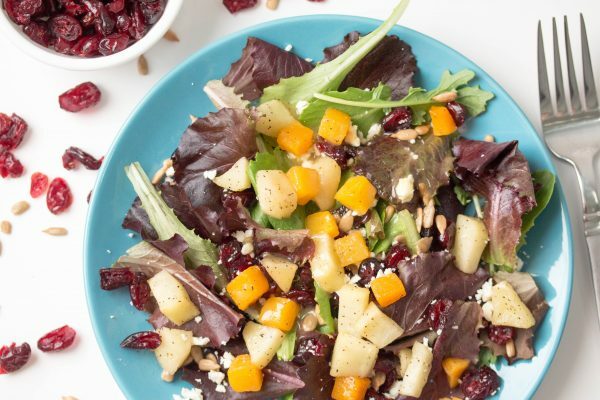 Butternut squash, juicy apples, and mustard vinaigrette make the perfect roasted butternut squash salad. It’s officially the holiday season!!! Let the delicious food start raining down. My most favorite holiday traditions are created around food. From my earliest memory down to present time, Thanksgiving always includes an extravagant amount of food with endless snacking throughout the day. Stretchy pants are a must on Turkey Day. Along with traditional juicy turkey and cranberry sauce, mashed potatoes, and classical stuffing, a variety of delicious sides need to accompany those classical main dishes. 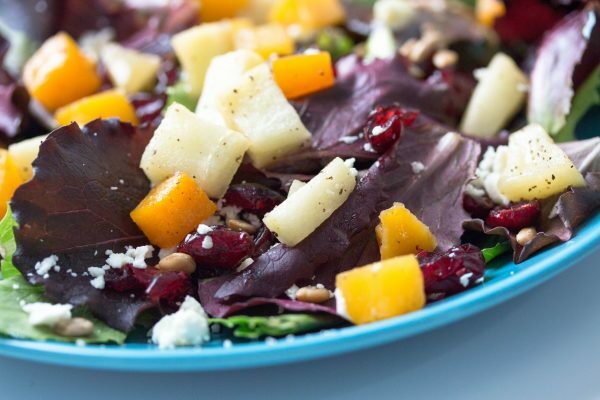 If you want a guaranteed win, look no farther than this butternut squash salad. To make preparation a little quicker, check out the produce section for butternut squash already chopped and packaged. Also, you don’t have to roast the apples. You can keep the apples fresh and crunchy instead of roasting and add them to the salad per the instructions. I hope you enjoy the anticipation leading up to Thanksgiving as much as I do! 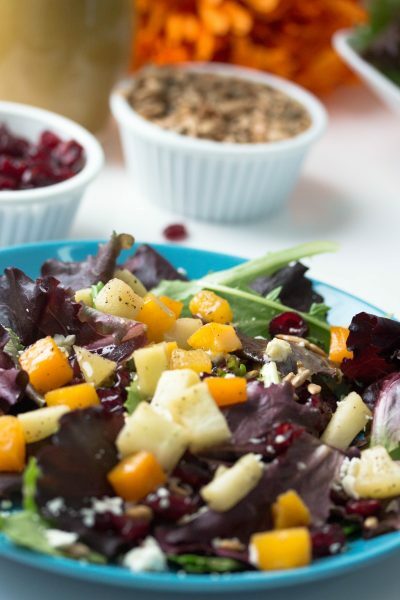 I also can’t wait for you to indulge on this Roasted Butternut Squash Salad! 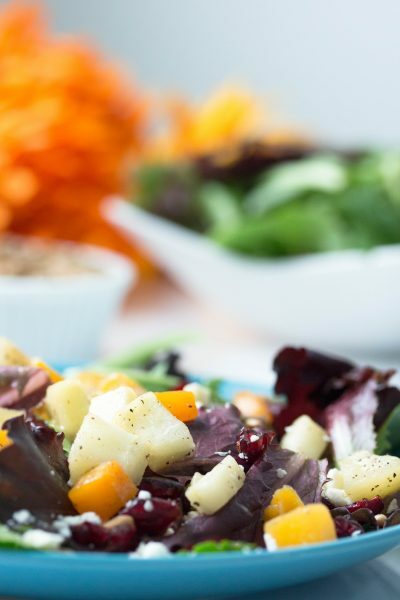 Roasted butternut squash with tart apples combined with a tangy mustard dressing makes a perfect salad for any occasion. Prepare your tastebuds for pure deliciousness! Preheat oven to 425 degrees F. In a medium sized bowl, combine olive oil and maple syrup. Add butternut squash and toss to evenly coat butternut squash. Spread butternut squash in a single layer over a large baking sheet. Sprinkle salt and pepper over squash. Roast in oven for 15 minutes. After 15 minutes, add apples to baking sheet with butternut squash and gently stir and combine the apples with the squash. Roast for 5 more minutes. Meanwhile, prepare the dressing by blending together garlic, mustards, syrup, and vinegar until smooth. While blending on the lowest setting, slowly pour in the olive oil. Refrigerate dressing until ready for use. Once butternut squash and apples are done roasting, allow them to fully cool to room temperature. For quicker cooling, place baking sheet in the refrigerator. In a large bowl, add the spring salad with 1/2 cup of dressing. Toss until evenly coated. Add more dressing per taste and toss again to coat. Remove half of the lettuce from the bowl. Leave remaining lettuce as the first layer of the salad. 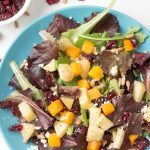 Evenly spread half of the butternut squash and apples, dried cranberries, roasted sunflower seeds, and crumbled feta cheese over layer of lettuce. Add the remaining lettuce on top. Repeat spreading the remaining butternut squash and apples, dried cranberries, roasted sunflower seeds, and crumbled feta cheese over the top. Serve with additional dressing as needed. Be sure to check the produce section to look for butternut squash already packaged and chopped into 1/2 inch pieces. This will make preparation much quicker and easier. Also, roasting your apples is completely optional. If you would like to keep the crunch of your apples, peel and chop your apple as instructed and then toss them in a small bowl with and additional 1/2 Tablespoon of maple syrup.